If your account (or your provider's account) is using the Zoom platform, participants have the option to call into the conference using the Zoom meeting ID. This is different from the SecureVideo ID, but this support article will go over where to obtain this number and how to use it. 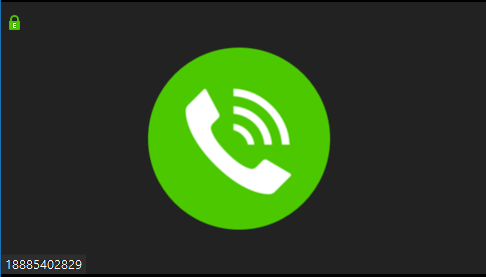 If you are joining a session that requires a payment, the dial-in buttons referenced below will not appear until the payment has been made. If your account administrator or provider has not enabled dial-in, the buttons referenced below will not appear at all. 1. If you have been invited to a session with an invite, click on the link in that invite to get to the waiting room page. 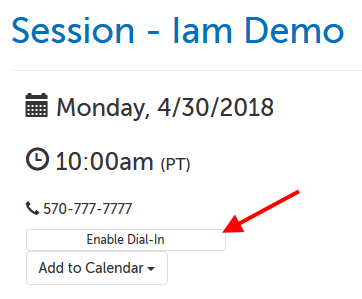 Click on the button labeled "Dial Into Session". 2. The area will expand with the dial-in number and the code (Zoom meeting ID) you will need. Once you call the dial-in number, you will be prompted to enter the code and press the pound sign (#). 3. If the meeting has not started yet, you'll hear hold music. Once the call has started, you'll be told how many participants are currently on the call. To your host and other participants (if any) that have joined by video, you will be represented by a phone icon, with your phone number in the lower left-hand corner of the video tile. You will be given the option to enter a participant ID, but click the pound (#) key to skip and be placed into the conference. 1. If you have been invited to a session with an invite, click on the link in that invite to get to the waiting room page. Click on the button labeled "Enable Dial-in". 2. The button label will change to "Dial Into Session". Click on it. 3. The button expand with the dial-in number and the code (Zoom meeting ID) you will need. Once you call the dial-in number, you will be prompted to enter the code and press the pound sign (#). 4. If the meeting has not started yet, you'll hear hold music. Once the call has started, you'll be told how many participants are currently on the call. To your host and other participants (if any) that have joined by video, you will be represented by a phone icon, with your phone number in the lower left-hand corner of the video tile. 1. If you have been invited to a session with an invite, click on the link in that invite to get to the waiting room page. Click on the button labeled "Request Dial-In". 2. The button will fade (to prevent being clicked again) and a chat message request will automatically be sent to your host. It'll open in the lower right hand corner of the page. 4. Once your host has clicked that button on their end, the button label you see will change to "Dial Into Session". Click on it. 5. The button expand with the dial-in number and the code (Zoom meeting ID) you will need. Once you call the dial-in number, you will be prompted to enter the code and press the pound sign (#). 6. If the meeting has not started yet, you'll hear hold music. Once the call has started, you'll be told how many participants are currently on the call. To your host and other participants (if any) that have joined by video, you will be represented by a phone icon, with your phone number in the lower left-hand corner of the video tile. 1. If you have been invited to a session and have an account, log in and go to your Dashboard. On the left-hand side of the session, click on the button "Dial Into Session". 1. If you have been invited to a session and have an account, log in and go to your Dashboard. On the left-hand side of the session, click on the button labeled "Enable Dial-in". 2. 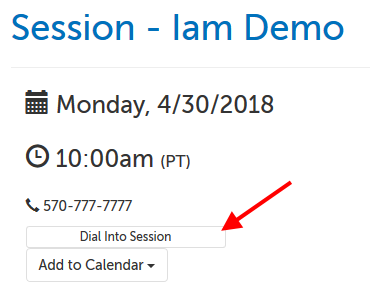 The button label will change to "Dial Into Session"; click on it. 3. The area will expand with the dial-in number and the code (Zoom meeting ID) you will need. Once you call the dial-in number, you will be prompted to enter the code and press the pound sign (#). 1. If you have been invited to a session and have an account, log in and go to your Dashboard. On the left-hand side of the session, click on the button labeled "Request Dial-In". 5. The area will expand with the dial-in number and the code (Zoom meeting ID) you will need. Once you call the dial-in number, you will be prompted to enter the code and press the pound sign (#). This article was last reviewed by our Support team on April 25, 2018.